Quick script that will connect to a server and retrieve all the ssis packages from the msdb database and create a report of all the connections in said packages. I shamelessly stole the xslt (and modified a bit) from here. This will copy all the ssis packages on the server to your user profile directory under the ServerName directory you pass in. Not thoroughly tested at all, use at your own risk. WHERE    c.folderpath NOT LIKE 'Data Collector%'"
#clear out the directory. Obliterates everything. throw "This is only supported on sql server 2005 and greater." #load dtsx xml into xml document so we can encode it to xml propertly. #The xml is stored as an image type with &gt;, &tl; etc... in the database. 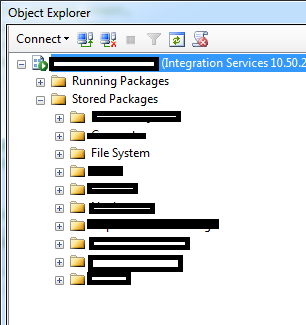 In order to add a remote server to your local instance of ssis you have to add said instance to your config file for ssis. The location of your config file for ssis is C:\Program Files\Microsoft SQL Server\110\DTS\Binn\MsDtsSrvr.ini.xml (if on x64). After you’ve added the server, you’ll need to restart the Integration Services service on your local machine. Then, open up the integration services on your local machine, expand the Stored Packages node and you should see the machine that you just added. There are roughly 280 million records in one table in particular that need to be moved to an archiving database on the same server. Usually, my approach is to BCP out the data that I want to keep and BULK INSERT it back into a new table, but I decided to try a new approach based upon Henk Vandervalk’s article here. As you can see in the image below, this partitions the table up into sets based upon the remainder of the ID field divided by the MODULO operator rounded upwards. 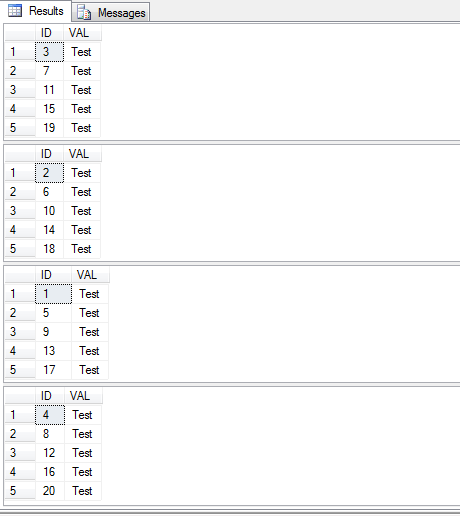 So, in SSIS I created a Data Flow Task. In said Data Flow Task I created 4 OLEDB Sources. In the sources is where I put the Sql Select statements that utilize the MODULO operation to divide up the sets of data. 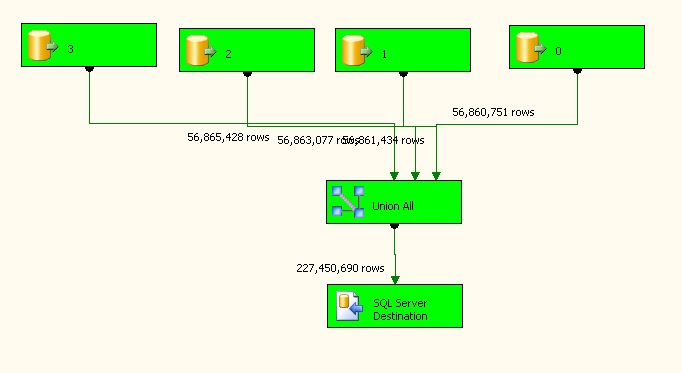 I then dragged the output of all 4 to a UNION ALL transformation and then the output of the union all goes to the Sql Server Destination. Of note, you can only use the Sql Server Destination if the destination table is on the local server. If not, you must use an OLEDB Destination. The result of this was moving 227 million rows in about an hour. Not bad! When doing this via BCP/BULK INSERT, the BCP out alone took over an hour, and the import took another 45 minutes on top of that. This essentially cut down the loading time by about half! Another thing I did to speed up the transformation was to increase the default packet size on the connections from 4k (Sql Server default) to 32767 (also mentioned in Henk Vandervalk’s excellent post).